Thanks to Dan for alerting me to the new website for the new Sterling By Music Man brand, which will be priced somewhere around the same level as the now discontinued Ernie Ball Music Man SUB series. The site will be fully operational from March 2, but there’s already a downloadable catalog there to check out. Pictured is the John Petrucci model. I really really wish they’d accepted the extra cost and installed Dimarzio pickups in this. I imagine a lot of players will swap the pickups as soon as they get the guitar, which is exactly what many have done with the budget-priced OLP Petrucci model. I like that there are two Axis models, and I’m sure that if this first run is successful, they’ll add some colour options and other models. Perhaps a Petrucci 7-string, or a Steve Morse model? I’m looking forward to trying these, and if I get my hands on one I’ll be sure to post my thoughts here. Former Megadeth guitarist Glen Drover is auctioning his famed ‘Peace Sells’ ESP. I saw Glen with Megadeth four times and this axe always got a strong reaction from the crowd (although I liked his ‘Countdown To Extinction’ model even more). CLICK HERE to see the guitar or place a bid. 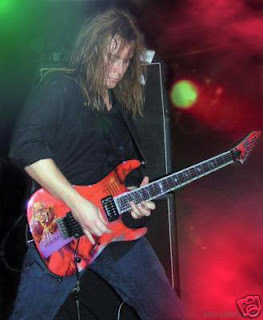 This guitar was made for Glen Drover in 2005 and given to him by ESP guitars at the 2005 NAMM convention in California, for the ESP anniversary party. It was also used by Glen for all touring for 2005 and 2006 with Megadeth. This is an “ESP” version of the LTD Deluxe M1000 and designed to Glen’s specs. Easily the most popular guitar from Glen Drover’s collection used while in Megadeth. Front cover “air brush” of the Megadeth album cover “Peace Sells, But Who’s Buying” on front body and head stock. purple transparent finish on back of guitar. 1 volume control, 1 tone control pot. If Vs are more your style, Dean offers a few graphic Dave Mustaine models, including the low-cost VMNTX with the ‘United Abominations’ album cover, and the new ‘Rust In Peace’ VMNT. CLICK HERE to buy the Dean Dave Mustaine VMNTX United Abomination Electric Guitar Graphic from Music 123. The final entry in Sparkly Guitar Week is the Fender J Mascis signature Jazzmaster. Mascis rose to prominence as the leader of Dinosaur Jr, and can always be relied upon for fuzzed out freakage. Fun fact: This one time, I was wearing my Dinosaur Jr shirt, which has a picture of Mascis’s bulldog on it. I was strolling along Acland St in St Kilda and I saw this dude walking towards me, staring at my shirt. I thought “That dude looks like J Mascis.” Then I got to work and read the paper. In the entertainment section was a photo of the same dude from Acland St. It was J Mascis, in town to do a solo gig. A-doy. Anyway, here’s what the Fender website has to say about the J Mascis Jazzmaster. To honor the sonic legacy of alt/indie rock founding father J Mascis, Fender is supremely psyched to unveil the sparkling-new J Mascis Jazzmaster guitar. Mascis took the instrument to a new place with his feedback-drenched, distortion-laden band, Dinosaur Jr. This new signature model pays affectionately ear-splitting homage to Mascis, giving the instrument a modern makeover for fans who’ve been clamoring for such a model for years. With its stunning and unusual Purple Sparkle polyester finish, matching headcap and gold anodized pickguard, the guitar features mods requested by Mascis himself—including an Adjusto-Matic bridge, reinforced tremolo arm housing and a satin-finished neck. The Dinosaur roar comes from dual vintage reissue pickups and the barrage of controls the Jazzmaster has always been known for—a three-position toggle switch with volume and tone knobs and, for this model, a two-position slide switch with volume and tone controls configured as a “lead tone circuit” (up) and a “rhythm tone circuit” (down). Available beginning in July 2007, the J Mascis Jazzmaster is literally a sparkling new addition to the Fender lineup, in celebration of the adventurous and continuing sonic contributions of the man who has been the model’s constant champion for nearly 25 years now. HERE’S one on eBay or you can see more HERE. Or you can get one HERE at Music123.